Today is the 50th birthday of Prozac Nation author Elizabeth Wurtzel. Because this book has had such an influence on me, I feel I should honor the author on her birthday. I seem to have a lot on common with Wurtzel. Even though I didn't go to Harvard, I have found many other similarities. Her date of birth and mine were both on a Monday. In one chapter of the book, she recalls her 20th birthday in 1987 and that it fell on a Friday. My 20th birthday, in 1991, was on a Friday as well. This seems as eerie as the many similarities people have found between Lincoln and Kennedy. Did you know both were assassinated on a Friday, for one thing? mentioned something from the book I had not remembered until I ordered a copy of it, something I decided to include in my new epilogue. And I looked ahead to see what day my 50th birthday will be on in 2021. Yes, a Monday. How weird is that? Ms. Wurtzel was recently interviewed by Liz Phair for Interview Magazine. Sadly, right now I cannot find any news about the author's birthday today. But I knew and am wishing the author a happy birthday. I just decided to change one thing about my memoir. What I had written as the epilogue seemed too long to be such. It got to 27 typed pages. So I converted it to another chapter, and now up to 16 chapters. And I have begun a new epilogue. Yesterday I added a quote I had found in Prozac Nation that I had not remembered until I ordered a copy of the book. It was something along the lines of how all depression stories are different. 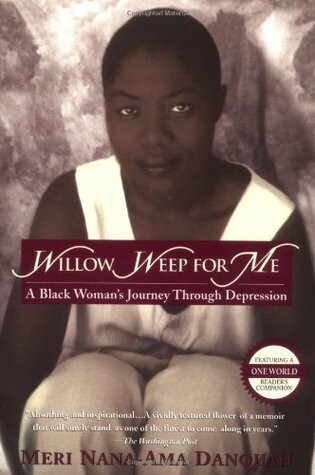 And recently I read Willow Weep for Me: A Black Woman's Journey Through Depression by Meri Nana-Ama Danquah. This is among the books we have at the center where I work. There was a quote in this one about not repeating what had already been said about depression if the author was to write a piece on it, mentioning William Styron's memoir on depression. The author of Willow Weep argued she and Styron would not have the same angle on anything. In other words, another person who saw how each person's story is different. This is another interesting book on depression, BTW. I had included these quotes in what had been my epilogue, but have since removed then to include them in the new one. I'd been considering doing an afterword after the epilogue, but my original epilogue just seemed too long. So far, though, I plan to add no other chapters, and don't think an afterword will be necessary now. As writers, should we choose to look for it, we can find advice about almost every aspect of our craft. From how to develop your characters to plotting your plot. From how to approach publishers, to how to make a success from DIY publishing - there are literally thousands upon thousands of pieces of advice out there. There is a tiny problem, however. Not all of it agrees. Of course, as with anyone that has had an opinion on anything ever, there will always be someone who feels the exact opposite way. But when it comes to writing we are often bombarded with so many rules, so many do’s and don’ts that it can not only feel overwhelming, but can actually have a negative impact on the quality of our writing, and how much we enjoy doing it too. There are lots of so called ‘writing rules’ that seem to be bandied about quite often. Rules which don’t necessarily make any sense. Here are just some of them that we think should definitely be taken with a pinch of salt. The same can be said about making cultural references to the past. Since I'm writing a memoir, I've had to reference lots of people my age will remember, but which kids today aren't aware of. A payphone, a VCR, the Walkman, among other things we kids in the '80s used and remember. I can remember when VCRs were too expensive for most people, which I have referenced in my story. I have also begun working on something else, though I haven't done much on this one lately. In this '80-set book, the main boy says how he thinks his mom can't afford this "new thing called a VCR that allows you to record TV shows to watch later." OK so opening with ‘it was a dark and stormy night’ can seem a little cliched, but if the weather is important to set the tone and the mood of your story, don’t shy away from including it in your opening lines. If you can describe the weather in an arresting and unusual way, this can capture your reader's attention from the outset and pull them into the story. One thing we learned at the recent memoir writing class was to avoid cliches. But for me, weather hasn't been the most important part of what I am writing. And certainly not the beginning part. Many excellent books don’t start in the middle of a scene. Some begin by describing a character or details of the world the book is set in. Of course, action doesn’t necessarily mean ‘in the middle of a raging intergalactic battle.’ But there are other ways to begin your story, and if they feel right to you, just go with it. This one is not exactly pertinent to what I am working on either, but definitely a rule that can be used the way you think it fits in your story. Some pieces of advice appear to say that starting your book on a low point will depress and put off your readers. This is nonsense. Every book is different and opening yours where the protagonist is about to do something dreadful, or something dreadful is happening to them, can actually be incredibly powerful. Even though I'm writing a memoir on depression, I chose to being my prologue with some background on myself and where I live, then proceed to tell the the main story. BTW, I just decided to add the information above, as I had originally began my prologue without mentioning my name. People don’t speak in full, proper sentences all the time do they? Nor do they have perfect English. If you want your character's dialogue to be believable, writing in sentence fragments, or having them stutter or trail off, can be an effective way of doing so. Yeah, this was something our teachers always said not to do. But I recently have seen some books with sentence fragments. I have tried avoiding using sentence fragments, but have found using them a way to break up overly long sentences. Some advice claims that reading books while you are writing will either put you off, or it will mean you immediately copy that writers style. This is ridiculous! Reading is a fantastic way of inspiring writers and helping us to learn and grow. Yes, we have always been told to read while we write. Who has said otherwise? No one that I know. Some pieces of advice even baulk at the idea of using the word ‘was’. While writing in the present tense does bring immediacy to a book, if you choose to write in the past tense, or have instances where you do, it doesn’t mean that your book won’t be a success. I nearly always have written in the past tense, as I once assumed that was how we were supposed to write. And what I am doing was in the past, so it stand t reason that I mostly used past tense. Believe it or not, readers don’t need to have a happy ending to enjoy a book. If you feel your book should end in a way that your protagonist doesn’t get what they want, or they do but at such significant cost it barely seems worth it, this can be just as effective. It may leave the reader feeling shocked and upset - but not cheated, and that’s the most important thing. Yeah, not all endings can be happy. What else can I say to this one? Writing advice is great, and can really inspire writers and help them to improve. However, if a rule doesn’t feel right to you there is no need to take it as gospel. Sometimes breaking the rules is what it’s all about after all! Some of these I was not aware of to begin. A bad review, however, is something quite different. A bad review means that someone has not only read your work but has such a strongly negative opinion of it that they feel it is their duty to share that with the world to protect them from the horror of your writing! That hurts. Bad reviews can have a devastating effect on the writer. They not only upset us but can really knock our confidence and put us off writing altogether. It can also put other readers off buying our books too! Whatever you do, do not respond to anyone who writes you a bad review. You’ll come across as petty and unable to take criticism. At the end of the day there is a distinct difference from someone who has written a considered, but negative review and explained why, as opposed to someone who has just written horrible things about your book for no reason. At the end of the day, the former has every right to be entitled to their opinion and the latter will just come across as an internet troll who other readers are unlikely to take seriously. If someone has written something personally offensive, you do have the option of reporting this to Amazon to see if they will take it down. A bad review is still a review and means someone thought your book was interesting enough to buy in the first place, so there is a silver lining! The fact of the matter is there is not a huge amount you can do about a bad review so just remain positive, keep trying to improve, accept it and move on. For most writers the good reviews far outweigh the bad - so when you are feeling down just read over all those wonderful compliments you got about your writing, and you’ll start to feel better soon enough. It’s important to always remember what inspires you to write in the first place. If you only do it to make money and get famous then that’s too bad. But if you do it because it’s your passion and you simply can’t not, then a bad review or two shouldn’t get you down for too long! Another thing I know to expect, even though I have not reached that point yet. Everyone knows to expect to get both good and bad reviews. Incidentally, the article refers to self-publishing, but I'm sure most of this is also true for traditional-published books. Yes, all of these sound like good ways to deal with a bad review. I guess I'm now prepared for such an event. As writers, we are always on the lookout for new ideas. We keep our eyes, ears and minds open in the hope that something will suddenly inspire us, and we will get that little spark of desire, that little flutter of excitement that means that a new idea is brewing. However, as writers, we also know that many ideas - yes even the ones we got really excited about, never actually translate to stories. Often we find that when we try to build on an idea out, or we sit down to start writing, we quickly realise that the idea simply doesn’t work when we try to turn it into a fully fleshed out story. This naturally can feel disappointing. However, if you find that this happens to you more often than you’d like, it may not be that the idea was simply a bad one, but rather that you haven’t put in the time and effort required to help it take off. So how do you turn an idea into a story? Here are some helpful tips. Once you have that initial spark of an idea, the next thing you need to do is brainstorm like crazy and see where it takes you. This part of the process should be fun and easy. Don’t put too much pressure on yourself - not everything you come up with has to be used, but just try to get down as much as possible. You could try creating a mind map, doing word association, or just jotting down snippets and little-fractured bits of the story on cards or post it notes and then moving them around and grouping them together to see if anything comes out of it. Once you have exhausted yourself coming up with lots of different ideas, it’s time to write your story outline. This doesn’t have to be a blow by blow account of what happens, but should have enough detail to make you feel confident that the story works, and that there is indeed enough of a story for you to bother writing it in the first place! Now you know your idea is going places, try to focus on your characters. No matter how good your plot is, it simply won’t work unless your story is full of interesting, intriguing characters who your reader is excited to follow. Spend time really getting to know your characters and thinking about ways to make them resonate with your reader. When you do this you will become so much more invested in your story, and you readers will care more too. Make sure that you do a thorough amount of research before you start writing your book. You don’t want your story to collapse because your premise was based on something that simply wouldn’t work in 'real life'. Of course, the beauty of fiction is having the poetic licence to create worlds where the rules and facts of the one we live in don’t apply. But if you are writing the kind of book that is based in the world as we know it, you need to make sure you get your facts straight before you begin. Every great book has a killer ending. Makes sure you know what yours is before you begin. This way you can see how the entire story will play out, right until the very end. Turning an idea into a proper story takes time and skill. Of course, your idea will change and grow along the way, but by following the above tips you can assure yourself that your idea will work as a story and that you don’t waste any of your precious writing time! I must admit I have had several ideas for a story that I never got around to writing down. I kind of slacked on they idea of writing for years, not knowing what I really wanted to do. And when I decided to write about my depression, I wasn't certain if I wanted to make it a novel or a memoir, but what I began writing sounded like a memoir. A while ago, I started writing a dairy-style book set in the 1980s. I haven't done much on this recently, though. I now wonder what I should do to research this idea, even though I lived through the '80s. And I'm not sure how it's going to finish. Writers are often told it’s important not to put too much pressure on themselves. This is good advice. Many writers struggle to do they very things they love because they are crippled with self-doubt and fear that they will never be good enough. We should all take steps to banish our self-critics and learn to write more freely and more joyfully. However, there is a difference between doing so and using this as an excuse not to try our best! It can be easy to try and fool ourselves that if we don’t give our writing our all, it doesn’t matter if we don't succeed because ‘we weren’t really trying anyway.’ It can also be dangerous to write with an attitude of ‘no one else has to see this,’ as it can make us lazy and distracted instead of doing what we should be doing, which is putting every effort into our writing, each and every time we sit down to do it. Always writing as well as you can has a big impact on how you learn and grow as a writer. Writers need to take pride in their work, and if you never try as hard as you know you can, how can you feel this way? If you always push yourself, always try to focus, and always try to make your writing the best it can be, you can finish the day knowing that you did everything you could to realise your dreams. The better you write the more your confidence will grow and the less you’ll put yourself down, so it’s great for your writing confidence and self-esteem too. Bad writing wastes time. While you can always go back and edit your work when you are done, the better your first draft is the less you’ll have to do! Don’t waste your own time by slipping into sloppy, lazy writing patterns. Make your first draft is the best it can be and you’ll be pleasantly surprised when you get to the editing stage. Of course, if you are a freelance writer, or you write an author blog, writing your very best also applies! If you continue to push out work that isn’t as good as it should be you’ll soon develop a bad reputation, lose work and put potential readers off too. Writing as well as you can means you are always striving to improve, to better yourself, and to learn and develop as a writer. If you never try, you’ll stay stagnant and stuck and you can never expect to get any better. You owe it to yourself to bring your A game each and every time you write. So next time you sit down to do so make sure you try as hard as you can to produce the best work possible - it’s so worth it if you do. Yes, all this is very true. One of the things I was told in my recent memoir writing class is to write every day, even if it's just writing in a journal or something. I'm still editing my memoir and and considering writing an afterword. I may even expand my prologue just a little. Just how much farther can I go, I ask myself each day. I did plenty yesterday, enough to make me feel I'm really putting my best effort into my work, and enough to leave me feeling exhausted! I'm now trying to decide what to do next. A short animation on the image of psychiatrists by Dr Kamran Ahmed. I mentioned in my book that I was once afraid of being labeled a "nutcase." But that isn't what happened at all. And FYI, my psychiatrist doesn't have a beard, but does sometimes wear a necktie and seems to always wear button-down shirts in shades of blue 🙂 He wears glasses, though. Writers are strange creatures, and just as sportsmen might have a cap or a medal they have to wear before a big game, or those going into an exam might take a trinket or ornament as a good luck charm, or have to perform a certain elaborate ritual before they begin, writers also have their weird and wonderful ways! We all know that while hard work, perseverance and always striving to improve will help a writer give themselves the best chance of success, but we also know that there is a good bit of luck that’s involved in the process. Being in the right place at the right time, having your proposal read when an editor just happens to be in a particular mood, and making sure your creativity never runs out - you never know when the fates will come together and things will work out for or against you! That’s why many writers don’t leave it up to pure chance to make sure they aren’t hit with a bout of bad luck, and many have adopted some, erm, let’s call them eccentric, rituals and beliefs to keep bad luck at bay and make sure they never get struck down with writer’s block. Alexander Dumas who wrote The Three Musketeers liked to colour code his work. Poetry was written on yellow paper, articles on pink, and fiction on blue. John Steinback wrote all of his novels in pencil and made sure he had twelve freshly sharpened pencils ready to go in his drawer before he started a writing session. Truman Capote would never begin a new piece of writing nor would he finish a current piece of writing on a Friday. He also did all of his writing lying down. Isabelle Allende would only begin a new piece of work on January 8th as that’s when she began her first successful novel, The House of Spirits. Friedrich Schiller apparently couldn’t get any writing done unless he could smell rotten apples and so kept some in his desk drawer at all times while writing! Other common writer superstitions are never having thirteen pages in a chapter, never giving your book a title until it’s finished, having a favourite writing tool or implement that you simply cannot live without, wearing a certain outfit to write in, and never calling characters any of your friends names in case something bad should happen to them! Do you have any weird and wonderful writing superstitions or rituals? Let us know! These are very weird indeed! I've been noticing that the page count on some of my chapters has been thirteen or more, but was not aware of the "never having thirteen pages in a chapter" superstition. Mostly because I don't believe in these things. and I never heard any writing superstitions until now. And I will never have any weird or wonderful new of my own. When it comes to writing we have a wealth of information at our fingertips, and there are so many ways we can learn, can grow, can improve. Of course, while this is wonderful, it is easy to get bogged down in with all the writing advice, the different techniques and the rules that we should memorise and apply to our writing, and often it can feel a little overwhelming. That’s why these 10 lessons are great to print out and pin up on your wall - they are quick reminders of the things you should be doing as a writer to keep you positive, active and engaged! To be an effective writer, you should write with readers in mind. However, the joy of writing comes from writing for yourself, because you love it. Never let go or compromise on that. When I first considered writing my story, others told me to write for myself, including my psychiatrist. Try to write every day. If you can’t, make sure you have a regular writing schedule and don’t let anything stop you from keeping to it. I've really been trying hard to follow this idea, though I don't exactly have a set time in which to work on my writing. I like to do it when I have the time and the energy. I say whatever works best for you. Comparing yourself to others won’t get you anywhere, instead let your favourite writers inspire you, and let other people’s success motivate you to find your own! That's what I've been doing, though I must admit I have had thoughts that my story won't be as good as others I've read. I have had times when I felt I was not good enough, but I have not let that stop me form writing my story. Try all sorts of different things with your writing, different types, different genres, different voices - it’s half the fun of the job, and you never know when you’ll find something that makes you feel like you’ve struck gold. I definitely want to do this. I started writing a YA diary novel set in the 1980s that I need to do more work on. I'm also considering taking some online writing classes that focus on writing different genres. There is one on writing for YA and one on writing for kids, as well as one on writing fiction like a pro. While writing on the surface, may appear to be a lonely task, writers actually rely on a whole team of people to help them. Family and friends, editors and book designers, publishers and agents, readers, critics and fans.. Always appreciate, communicate with them and nurture them. Still trying to find someone who can read my work and whose work I can read too. All writers need to learn how not to take rejection personally. It’s easy to think a criticism of your work is a criticism of you. It’s not. All writers get rejected, all writers get criticised - it just means you’re doing your job! Still not to this point yet, but I already know to expect this. We all get into a writing slump from time to time, we all suffer from self-doubt - there days where you think ‘what am I doing? Why am I wasting my time? !’ It’s OK to feel like that sometimes - just don’t let it last forever. Not just writers, but everyone gets this way. Whatever the reason, don't let it last forever. If every time you sit down to write you are determined to do your best, you’ll help yourself in the long run. Don’t aim for perfection, but do try your hardest - this way you’ll spend less time redrafting and more time feeling positive about your work. Exactly what I have been doing. I'm trying hard not to make it sound perfect, just understandable. Reading, listening to music, going for a walk, having a glass (bottle) of wine. Whatever works for you, find out and then learn how to harness that creativity so you always feel as though you are brimming with ideas and moving forwards. Reading definitely triggers my creativity. I've been waiting to go somewhere different to find inspiration. One of the online classes mentioned above is on travel writing. That might be interesting to learn about before going somewhere new. Drawing or watching movies are other things that trigger my creativity. At the end of the day, the writer who doesn't give up is the most successful - so learn from your mistakes, get over your setbacks, and never give up! So there you have it, 10 simple but effective lessons every writer should keep close to their hearts. What would you add to the list? These are all pretty good tips. Any you have? What to Put on a Memoir Book Cover?